Saint Arnold's Brown Ale made it's debut back in 1995, and was originally brewed to celebrate the brewery's first anniversary. It went over so well that it became one of the cornerstones of the lineup and has been brewed ever since. Saint Arnold promise the beer will be sticking around for quite some time, as it's the favorite of brewery owner Brock Wagner's wife. Designed as an English style Brown Ale, it took a little tweaking to get the recipe just right. Apparently, the key to the flavor profile the brewers were after was a splash (0.5% percent of the overall malt bill) of chocolate malt. The full ingredient list is composed of five varieties of malt, three types of Pacific Northwest hops, and a proprietary yeast strain. Saint Arnold describe the beer as "A beautiful, deep copper brown ale [with] a full, malty body with hints of chocolate, a touch of sweetness and a light hop flavor" and are particularly fond of pairing it with food. Their highest pairing recommendation is pecan crusted snapper, which sounds pretty awesome. Regrettably, I have no snapper on hand, so I'll just have to review the beer as is. Appearance: Crystal clear, but not the color you initially expect from a Brown Ale. This is a somewhat lighter and more orange interpretation of "brown." Up top, an off-white colored head that splits quickly and leaves little lacing. Aroma: Sweet, roasty malt with plenty of fruity, nutty, slightly chocolaty qualities. It smells darker than you would expect looking at it. Perhaps some light alcohol notes as it warms. Taste: Sweet, slightly bitter, roasted biscuity malt accented with chocolate, nut, and fruit notes. Despite not having much hop character, this still has good balance. The aftertaste is roasty and dry. Mouthfeel: Medium bodied and smooth with moderate carbonation. Nicely dry. Drinkability: Lighter in intensity and body than many Brown Ales, this is above average. 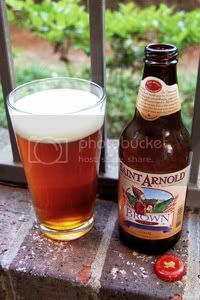 Verdict: Saint Arnold Brown Ale is just a little thin for me, I'd love to see a little more oomph in the malt backbone. But, that being said, this is still a tasty and sessionable little brew well worth a try.